Machines have revolutionized our lives, leaving no sphere untouched! Did you know the spoon, the chopsticks, the knife, the broom are all simple machines? 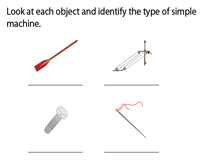 Explore these simple machines worksheets for grade 3, grade 4 and grade 5 to learn about the six types of simple machines - lever, pulley, wheel and axle, screw, wedge and inclined plane and the three classes of levers with ample examples, charts and hands-on activities for an in-depth understanding of the use of simple machines in our day-to-day life. 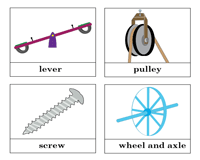 Familiarize kids of grade 3 with the six types of simple machines such as the inclined plane, lever, pulley, wheel and axle, screw and wedge with this vividly laid-out printable simple-machines chart. Comprehend how the position of the three parts (effort, load and fulcrum) of the lever defines the class. 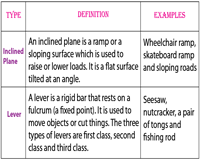 Learn to distinguish between the three classes with adequate illustrations featured in this classes-of-levers chart. 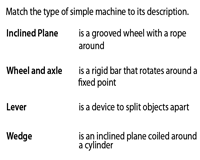 Equip children of grade 4 and grade 5 with this six-simple-machines-definition chart for a thorough knowledge. This tabulated chart comprises precise definitions accompanied by examples to correlate. 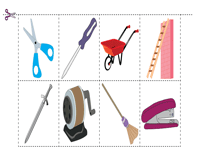 Constructively engage children with this interesting worksheet featuring six different levers. 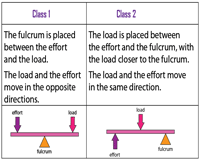 Identify the class of each lever as first, second or third and the three parts - fulcrum, effort and load as well. 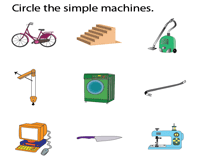 This visually appealing worksheet consists of illustrations of both simple and compound machines. The kids of grade 3 are expected to circle the simple machines to complete the worksheet. 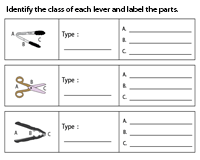 Differentiate between the simple and compound machines with this cut-and-paste activity worksheet. Snip the machines, sort them as simple or compound machines and glue them in the appropriate columns. 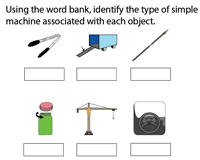 This worksheet comprises illustrations of simple machines. The kids of grade 3 and grade 4 are expected to recognize the type of simple machine and label it accordingly with words from the word bank. Brainstorm children of grade 5 with the uses of the simple machines presented in this worksheet. Examine each simple machine and identify the category to which it belongs and label it accordingly. Create different scenarios to focus on the importance of simple machines in our life. 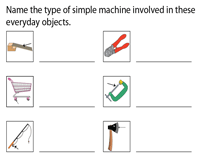 Follow-up with this worksheet for children to identify the simple machine associated with each everyday object presented here. 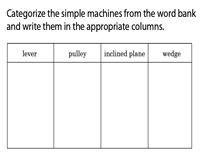 The benchmark idea of this worksheet is to comprehend the type of simple machine associated with each of the twenty-four simple machines listed in the word bank and write them in the correct columns. This worksheet assists in linking the concept to concrete examples. 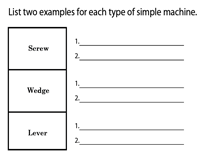 Look out for examples around you and state two relevant examples for each type of simple machine in this worksheet for grade 5. Make one-to-one correspondence between the simple machine and its description. Emphasize the concept of simple machines, their definitions and examples in the process. 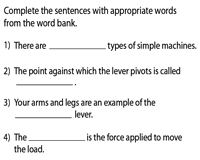 This worksheet features clear and concise statements and focuses on the key points of simple machines. Complete the sentences with appropriate words from the word bank applying knowledge acquired. Simple Machines Riddles | What am I? Problem-solving and critical-thinking skills are the two sought-after abilities. 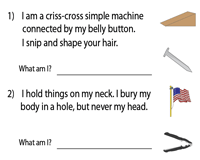 Entertain children with this worksheet and watch them generate witty answers to riddles related to simple machines.